History: A 50-year-old female school teacher presented with a two year history of swelling of the right third toe. X-rays were read as being commensurate with a malignant tumor (Fig. 1), and an en-bloc resection of the third ray was performed. A hard, multinodular, tan-gray 5.0 cm mass was found to primarily involve the proximal phalangeal bone and adjacent soft tissue. Microscopic sections showed the tumor to break out of bone and to involve surrounding tissues with extension up to the deep dermis (Fig. 2). The tumor displayed an osseous matrix consisting mostly of woven and trabecular bone often incorporating cells similar to those in the stroma (Fig. 3). 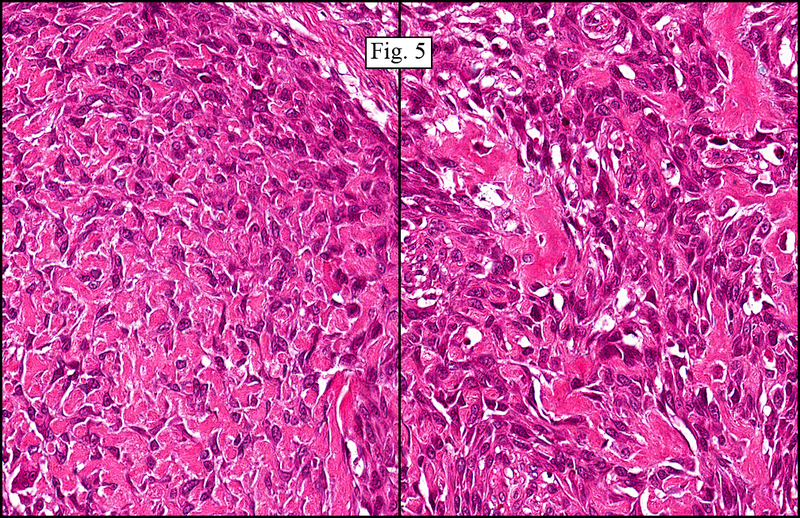 In hypercellular regions that lacked bone formation, the tumor displayed both spindled and epithelioid features (Fig. 4) and had scattered mitotic figures. There were also areas which displayed a lace-like pattern of stromal cells intimately associated with, and incorporated into, osteoid (Fig. 5). Osteoclastic-like giant cells were not seen. Discussion: Osteosarcoma (OS) is a tumor of atypical mesenchymal tumor cells which are able to produce immature bone or osteoid. It is the most common malignant primary osseous neoplasm (20%) and has a bimodal age distribution. Most cases occur in the second decade of life. Less common are those which present over the age of 40. Though the clinical course of this lesion is comparable in younger patients and patients over 40 years of age, there are different associations. In patients over 40, OS has been found to be secondary to radiation exposure, various chemical agents, viral infection or areas of pre-existing osseous Paget’s disease. In younger patients, no precursor conditions have been elucidated. There is, however, an association with previous trauma. OS has a male dominance (3:2). Our presentation case is most unusual in that it occurred in the toe. Osteosarcoma arising in a small bone has only been documented five times in the literature, with the last case being reported in August of 2000. Although most cases of osteosarcoma present in the metaphyses of long bones (most commonly in the proximal tibia and distal femur), in patients over the age of 50, there is a higher occurrence in the flat bones and axial skeleton. In both age groups, however, occurrence in the digital bones of the hands and feet is fleetingly rare. Osteosarcoma can be divided into three histologic subtypes based on the most prominent matrix material. These subtypes are “osteoblastic osteosarcoma,” “fibroblastic osteosarcoma,” and “chondroblastic osteosarcoma.” In rare cases with abundant giant cells, the tumor may be referred to as “giant cell osteosarcoma”. Metastatic dissemination of OS is mostly hematogenous, with lung being involved in 80% of cases that metastasize. Standard treatment for OS has traditionally been amputation of the affected limb, however the success of pre-operative chemotherapy has enabled use of limb-salvage techniques. With amputation only, the 5 year survival rate is from 5-23%, but with the pre-surgical chemotherapy, the overall rate jumps to 50-65%. Differential diagnoses include osteoblastoma, chondrosarcoma, Ewing sarcoma, pleomorphic sarcoma (MFH), giant-cell tumor of bone, and exuberant fracture callus. 1. Osteoblastoma (OB) can resemble osteosarcoma due to the presence of bony trabeculae. 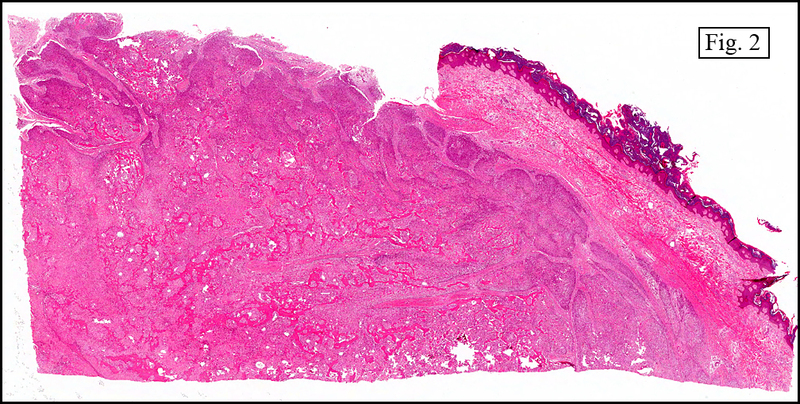 However, the trabeculae in OB are more uniform and there is less nuclear atypia, unlike osteosarcoma which generally grows larger (>5cm) and has a destructive pattern of growth which can engulf preexisting trabeculae. Most helpful is that the sites of presentation for these two tumors are quite different with OB preferring the sacrum, vertebral column, and craniofacial bones, locations that are very rare in OS. 2. Chondrosarcoma (CS) is usually distinguished from OS through radiologic, clinical and pathologic studies. Its presenting location differs from OS by showing preference for the truncal bones. There may be morphologic overlap between variants of CS and OS, especially chondroblastic OS compared to a CS with enchondral ossification. When confronted with this dilemma, factoring in the location of the tumor, the age of the patient and any preexistent or concurrent conditions may be of help. 3. Ewing Sarcoma (ES) can be confused with an OS composed primarily of small cells. It may also be mimicked by other small, round-cell neoplasms including lymphoma, and even some rhabdomyosarcomas. However, none of these tumors form a stromal matrix and each has its own unique immunohistochemical profile. 5. Giant-cell tumor of bone may be confused with osteoclast-like giant cell osteosarcoma. However, giant-cell bone tumors most often occur in the epiphyses while osteosarcomas are most commonly found in the metaphyses. GCT usually has a uniform distribution of giant cells, while osteoclastic osteosarcoma shows region to region variation in the number of multinucleated cells. 6. Exuberant Fracture Callus may mimic OS by having a high mitotic rate, atypical osteoblasts and the production of osteoid. A distinguishing factor between the two entities is the more uniform histologic progression of healing that is present in callus but is lacking in OS. For example, the trabeculae in a callus are usually arranged in parallel, a pattern that differs from OS in which a haphazard deposition predominates. Also, the history of trauma and/or the presence of a hematoma is supportive of a reparative process. 1. Gangadharan VP, Ramachandran K, Elizabeth SK, Preetha S, Chithrathara K, Elizabeth KA. 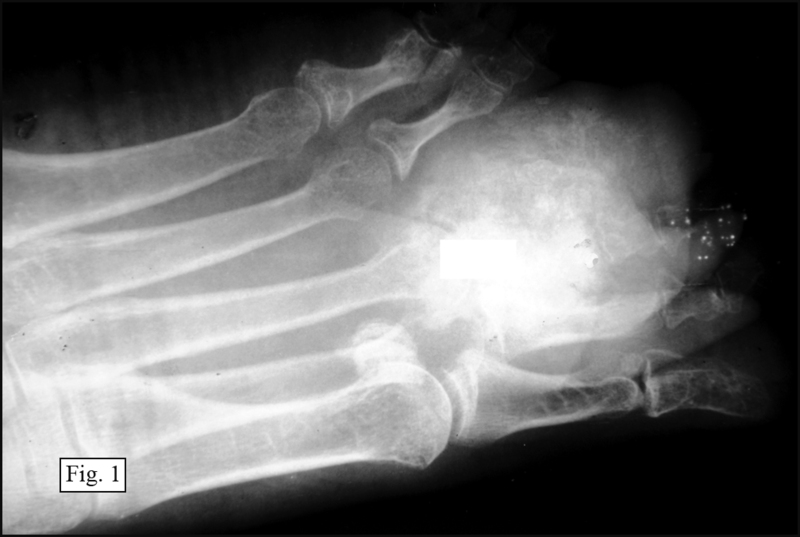 Primary Osteosarcoma of Metatarsal Bone. Am J Clin Oncol-Canc; 23(4):429-30, 2000. 2. Dorfman HD, Czerniak B. Bone Tumors. Mosby, Inc. St. Louis,1998. 3. Rozeman LB, Cleton-Jansen AM, Hogendoorn PCW. Pathology of primary malignant bone and cartilage tumours. Int Orthop; 30(6):437-44, 2006. 4. 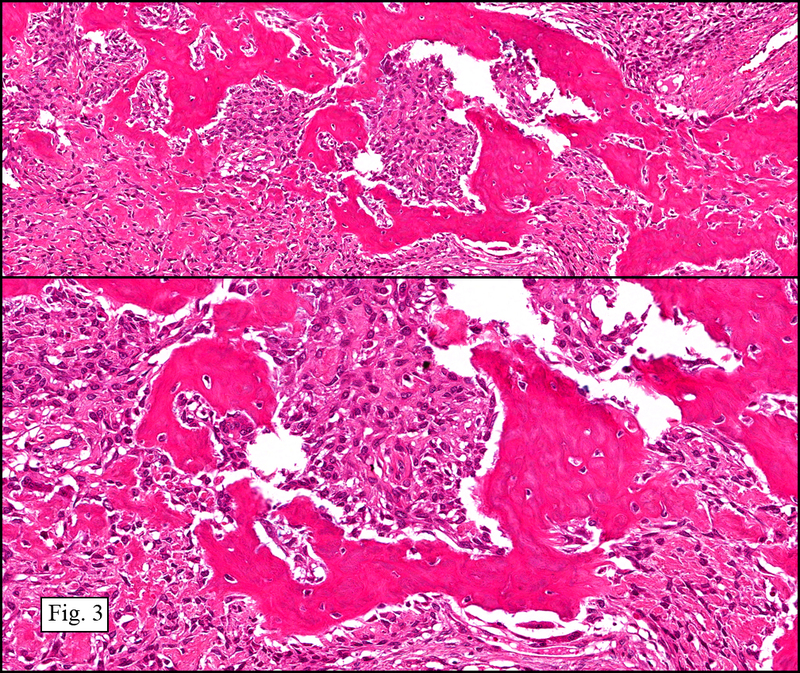 Gassiamis A, Tsakonas G, Soukouli G, Mylonakis N, Karabelis A, Kosmas C. Diffuse calcification of metastases after intensive multiagent chemotherapy in widespread osteosarcoma leading to death in a 18-year-old male. Med Oncol; 23(4):455-62, 2006. 5. Marulanda GA, Henderson ER, Johnson DA, Letson GD, Cheong D. Orthopedic surgery options for the treatment of primary osteosarcoma. Cancer Control; 15(1):13-20, 2008. 6. Weiss SW, Goldblum JR. Soft Tissue Tumors. Mosby Inc. through Elsevier Inc. Philadelphia. 2008. 7. Wafaa E, Abdelhalim F, Chase DR. A 34 y/o male with a trauma-related mass in the right arm. California Tumor Tissue Registry, www.cttr.org, Case of the Month, vol 8(12), September, 2006.